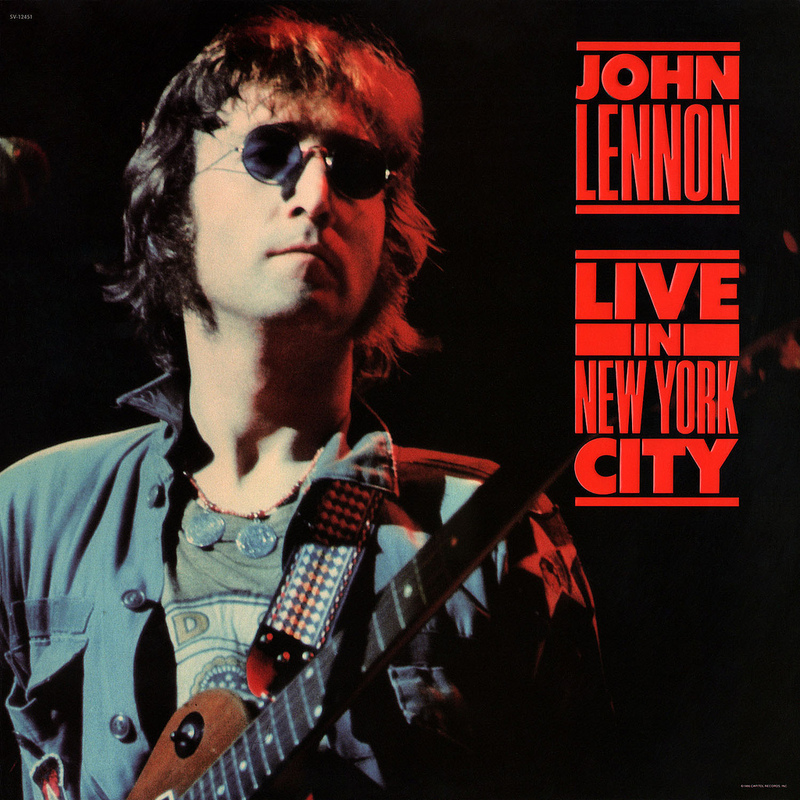 The U.S. Army shirt/jacket worn by John Lennon on the cover of the “Live in New York” album has to be the second most famous article of clothing that he ever wore. 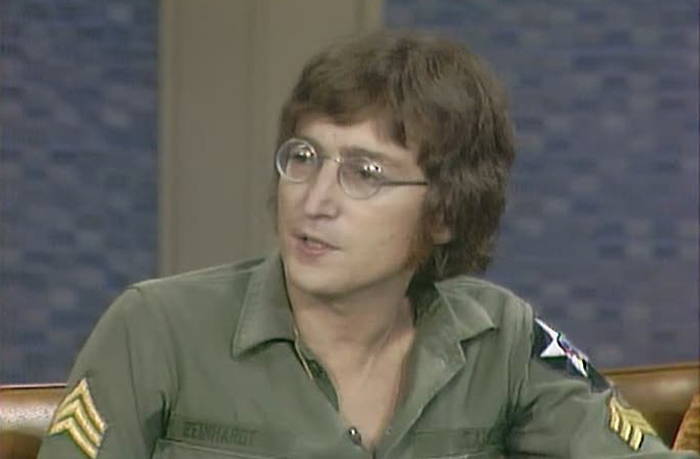 In my opinion, his U.S. military shirt comes in right behind John Lennon’s Famous New York City Shirt. The infamous photo for the cover was taken at the “One To One” Benefit Concert on August 30, 1972 at Madison Square Garden, New York. 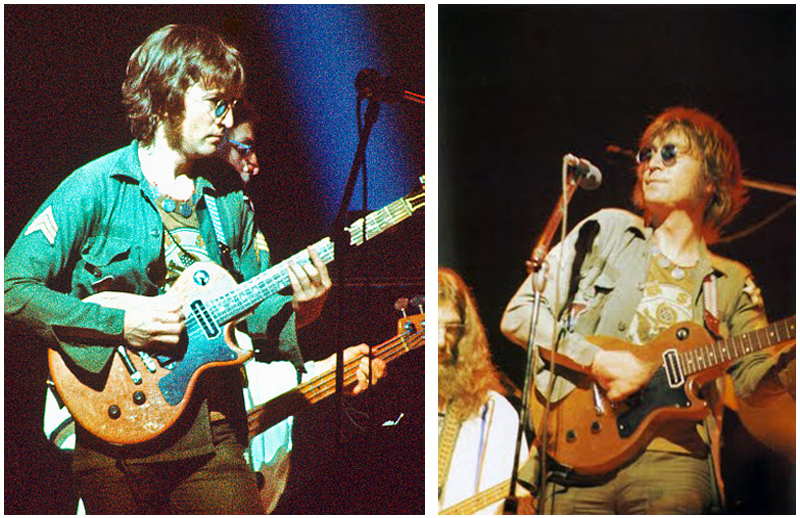 Here are some other photos of Lennon on stage with the shirt that night. The shirt was one of Lennon’s favorites to wear in the early 70’s. He not only wore it on stage at Madison Square Garden but he also wore it for photo shoots and casually around town. The shirt is an OG-107 fatigue utility shirt issued to all U.S. Army soldiers circa 1970. 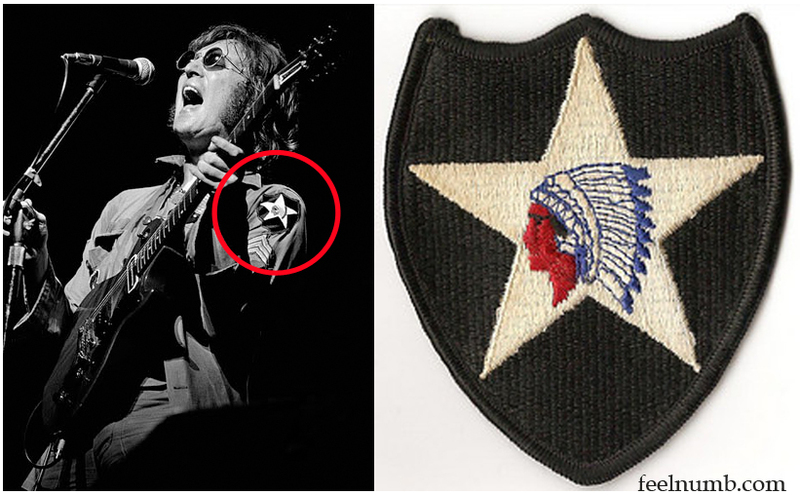 Lennon must have been confused as this shirt was not used during the Vietnam War, rather it was used during the Korean War as you can tell by the patches. It has the soldier’s name “Reinhardt” above the right pocket and the U.S. Army patch over the left pocket. The patch on the top left shoulder is a “2nd Infantry Patch“. The 2nd Infantry Division is a formation of the United States Army. It’s current primary mission is the defense of South Korea in the initial stages of an invasion from North Korea until other American units can arrive. 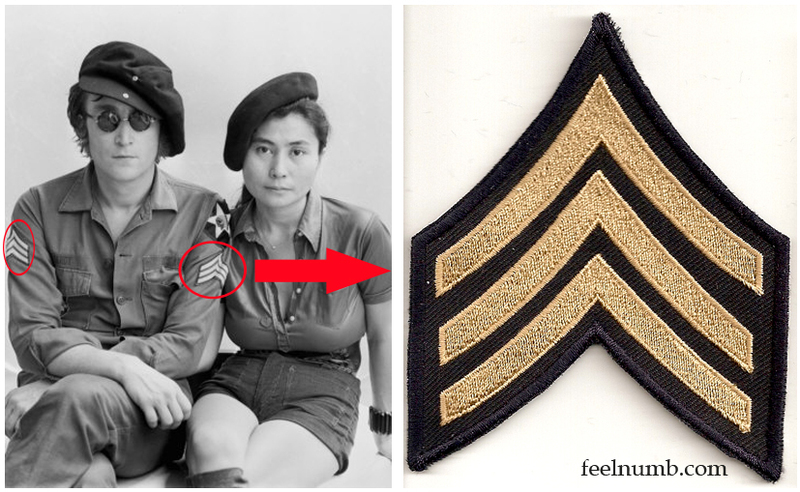 The patch on the right breast pocket is a “Imjin Scout Regiment Patch”. The Imjin Scouts, are part of the 2nd Infantry Division and were active in Korea patrolling the area along the Imjin River from 1967 to 1994. A soldier would receive the patch after 20 patrols in the DMZ (Demilitarized Zone) near the river. Unless these were added by Lennon, soldier “Reinhardt” must have had the rank of “Sergeant” because the jacket has the Sergeant Chevron stripes on each sleeve. The REAL coat was given to girlfriend May Pang in 1975. John wrote a love message to May on the inside of the coat and the coat is now on display in the John Lennon Museum in Japan. 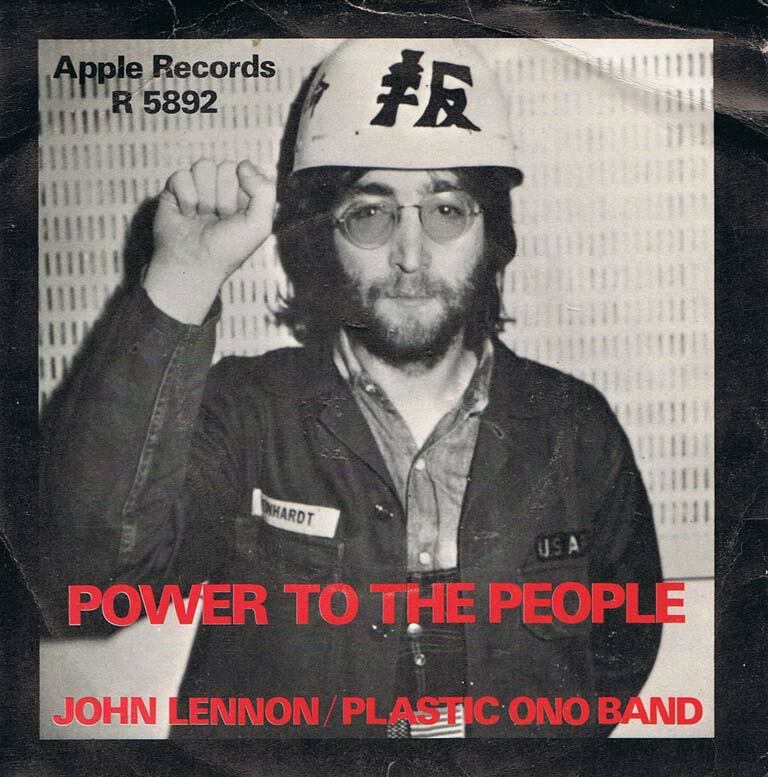 UPDATE: We noticed that on the cover of the John Lennon/Plastic Ono Band, “Power To The People” (Apple R 5892) the “Reinhardt” patch is white instead of green and it is missing the patches. Did he have 2 of these jackets from the same soldier??? UPDATE 2017: The last name on the jacket worn by Lennon is REINHARDT and that was the only thing we knew about the mystery soldier, UNTIL NOW!!! Click photo or link below to find out about Sergeant Peter James Reinhardt!!! There is a mistake with the Imjin you have posted here… The correct one had DMZ on the bottom…Check it out, you'll see I'm right. 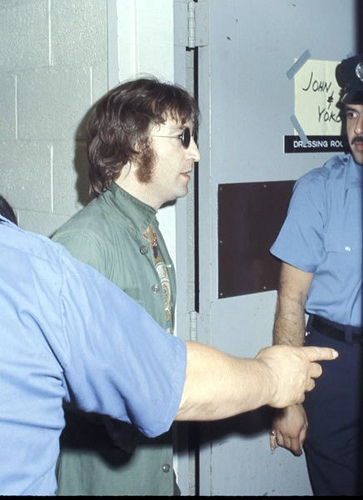 I have re-made this shirt with the greatly appriciated help from this website, and now im looking for the under shirt Lennon is waring in most of these photos, i wanted to know where or if i can find one, it would be really cool if i could actually find it, Thanks. We added the correct patch at the bottom of the story. Thanks Tony! 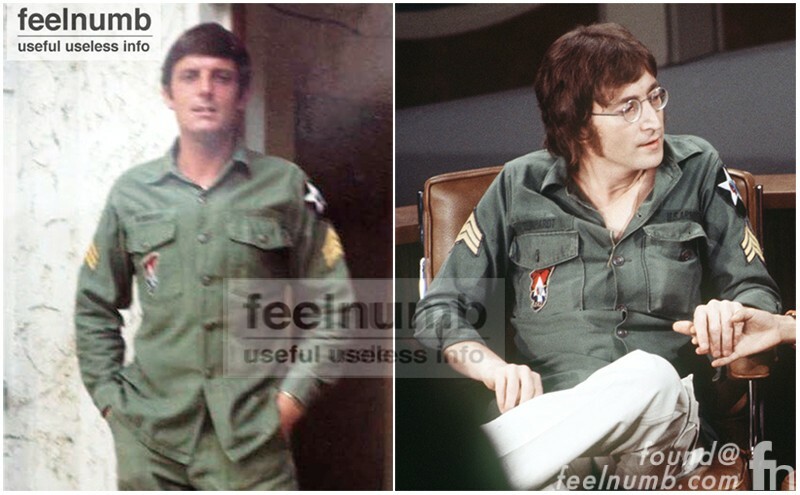 Richard, this uniform was worn by a soldier in Korea, not Vietnam. 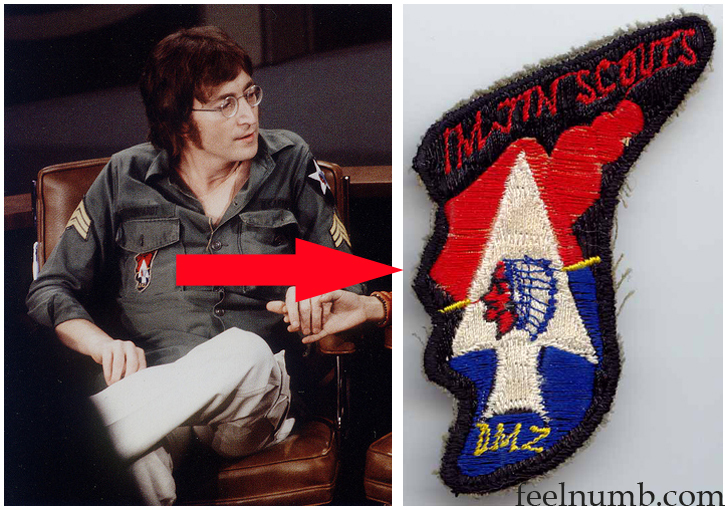 2ID did serve in Vietnam but the patch on John's right breast pocket directly references the DMZ. The 2nd Infantry Division is stationed near the DMZ in South Korea. I'm currently in 2ID and have never seen the patch on John's right right breast pocket. It could still exist but I've never seen it. The 2ID patch with the Indian head is still worn on every soldier's left shoulder and should be easy to find. To replicate the uniform you need to research whether it's a Korean War era uniform or from the Vietnam era. Although John wore his ACU top during the Vietnam war, American soldiers have maintained a presence in Korea for almost 60 years. it's hard to know whether he purchased a uniform that was sitting in an Army surplus store for 15 years or 6 months. 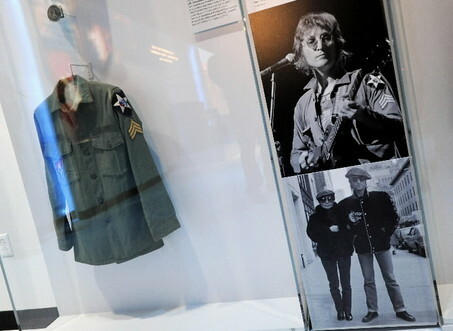 I recall hearing in an interview from Lennon where he said that a soldier just back from Vietnam was going to toss it in the trash, but instead gave Lennon the jacket at an airport. I may be fuzzy on the details, but I remember him saying a soldier gave it to him. But — the 2nd Infantry did not serve in Vietnam. They were based in Korea along the DMZ during the Korean War (1950-53), then sent back to Korea in mid-1965 where they maintain a presence today. 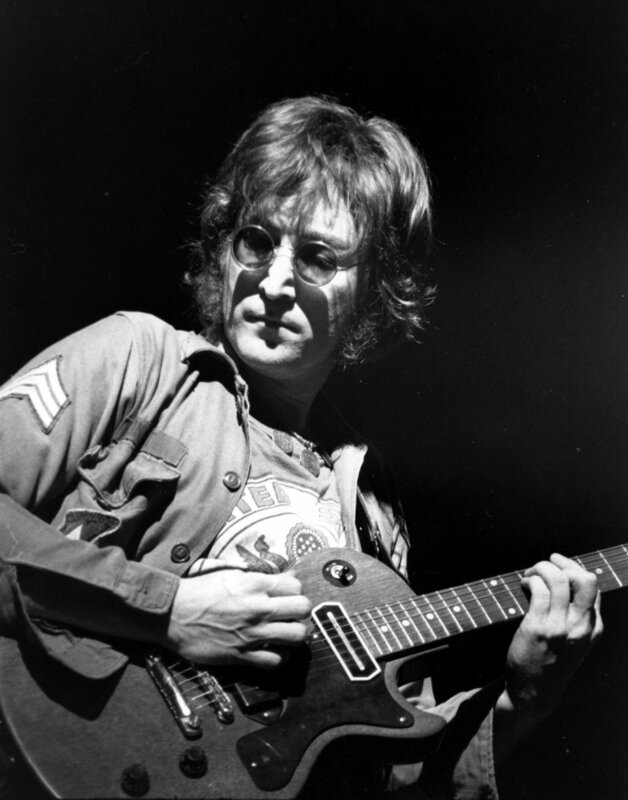 So, if true, the soldier wasn't in Vietnam with the 2nd — so there are conflicting stories out there regarding the origin of how Lennon actually got the jacket. The Imjin Scouts, as part of the 2nd Infantry Division, were active in Korea patrolling the area along the Imjin River from 1967 to 1994. A soldier would receive the patch after 20 patrols in the DMZ near the river. These soldiers were subject to contact with North Koreans from time to time and firefights did occur. 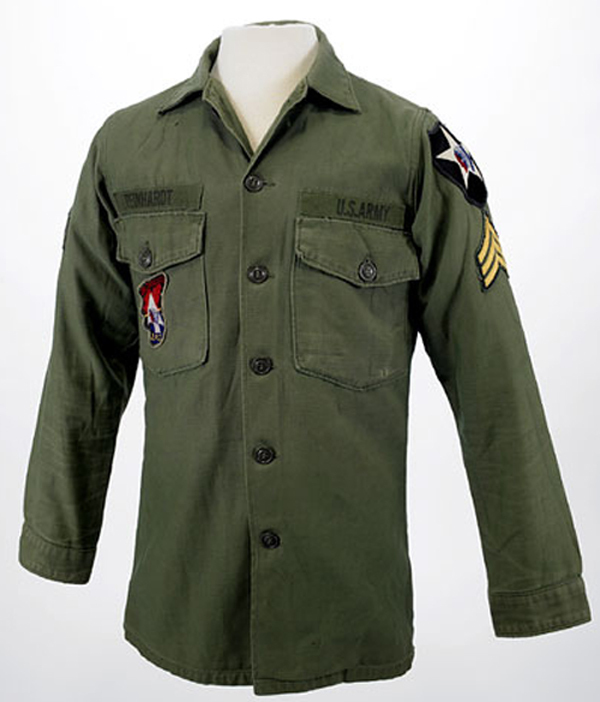 The shirt John Lennon wore would be an OG-107 fatigue shirt issued to all U.S. Army soldiers at the time, circa 1972 or slightly earlier . I am trying to put together a replica but A genuine Imjin Patch is really tough to find. The shirt without patches is fairly easy to catch on EBAY. Hi, does anyone know anything about the necklace John is wearing? The one with the coins. I'm trying to replicate the NYC outfit, complete with jacket, shirt, pants, and necklace. Any info would be much appreciated. Thanks so much!! 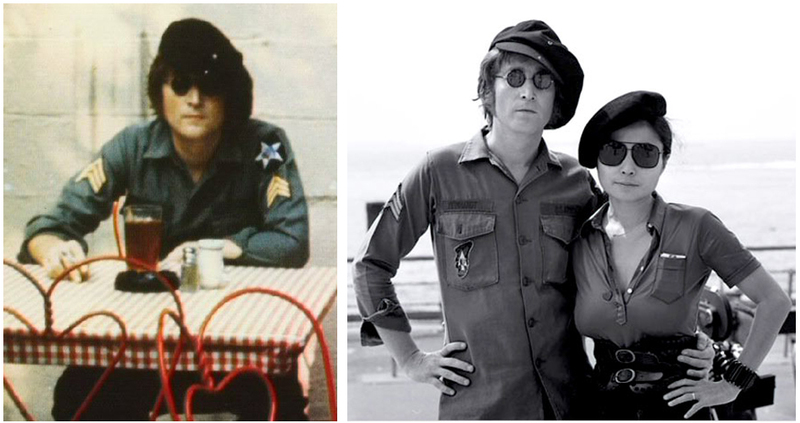 Hmmm, After seeing all the pictures, Could it be possible that Lennon in fact had two army shirts? The white nametags over the right pockets of OG-107 fatigue shirts went with gold "U.S. Army" tapes on the left. They'd been that way since the 1950s (See photos of Elvis Presley during his stint in the army) They also went with the "Fidel Castro" style "saucepan" rigid green hat. During the last half of 1967 the tapes were both replaced by "subdued" green, and were either printed or embroidered with the soldier's name ane "U.S. Army." The hat was replaced by a regular, "baseball" hat. 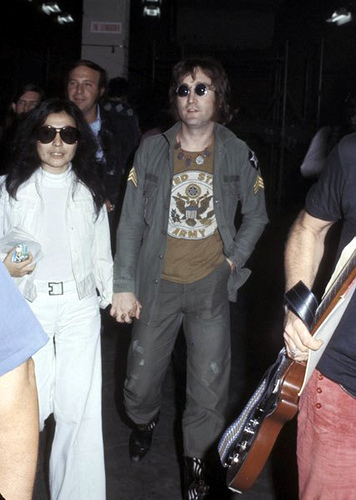 If John Lennon showed in photos with both styles of nametags, he must have had two shirts. He might have even had the white tape one printed with the name "Reinhardt" to match the other one he wore in concert. John is a legend. I have been meaning to dress like him for Halloween for the longest time. Not that im counting, but I have had over 300 people tell me I look like him. Been all over websites to try to make my costume look authentic. John was creative. He wants that for us too. Be free, and imagine. Have you seen the COME TOGETHER t shirts that are all over the net? A friend of mine and I designed and hand-screened to originals in 1969. There’s a photo of John wearing the shirt at Cannes. I first saw a photo of John in the COME TOGETHER t shirt in a special issue magazine right after his assassination. He was with Yoko in their backyard. I’ve never been able to find this photo again. I’d like to know how John got the t shirt since we only printed a dozen or so. It’s possible Frank Zappa gave it to him as my friend gave one to Frank when he was signed with STRAIGHT RECORDS in the 60s. We have the original silk screen that produced these shirts.